(Regarding the picture – In it I am in my late 50’s still enjoying my first animal love -Peaches. On what I hope was a beautiful golden October Friday in Lakewood, Ohio, I made my entrance into this world at 3 in the afternoon. Jesus died on a Friday around 3 pm. I think that might be the reason that I have always looked lovingly at a crucifix and thought how much Jesus must have loved us to die in this terribly painful and cruel way. Even today- the Stations of the Cross is one of my favorite devotions and not only during Lent. I am also a Depression-era baby and am proud that I may have some of their virtues - for one, taking care of possessions and making them do until they are completely worn out or useless. Perhaps I'm too much so, (bad for planned obsolescence) but then that's because I'm concerned about the environment as well. People today just buy and trash - filling up our landfills without giving a thought to the results of this "over" production which I believe translates into factories spewing waste products into the air and into our waterways. There is a price to pay and sadly we are beginning to realize that. But will we ever change our ways? So, this middle daughter of George and Suzana Megles, Slovak immigrants, was and perhaps still is a "maverick." Even then as a youngster I was worried about too much garbage! Of course, one reason was that I had no conception of how large the US was and I just wondered where we would put it all. My sisters probably have some of my same concerns but perhaps to a lesser degree.They certainly don't own anything passe like my mom's still working 30 or 40 year-old gas range. And they wouldn't be caught dead wearing my purple "terror" - a winter coat I bought from a Penney's mail order catalog 15 years ago and which turned out to be a big mistake. The purple pointed hood makes me look like a witch! Well, another thing about me - I hate to return things. And then my pride and joy - a royal blue '72 Mercury Comet with about 35,000 miles on it. Sadly,I'm not a great driver, but my faithful Comet takes me to medical appointments, carts home my dog and cat food, litter, and now in winter -some 300 pounds of bird seed. Then, of course, I grocery shop for myself which includes stopping at "The Bin," a health food store where I buy my soy ice cream, soy cheese, etc. -- all the food staples that the regular grocery store does not provide for this vegan. Growing up, I naturally think of my childhood and some of the things which happened in this largely Slovak enclave in the eastern part of Lakewood which began to be called "Birdtown" because of the eight streets in this tract. Five of them were named after birds - Lark, Quail, Robin, Thrush, and Plover. I was born on Robin Street. over to the other side of Madison. The Eastern Europeans who settled here each came and built their own churches- 7 of them - all within walking distance! Imagine you could go to a different church each day of the week if you wanted to, but then my mom and dad made it clear to us that we could only go to the Catholic churches and there were 3 of those - St. Cyril's - a large Slovak Latin Rite church, St. Hedwig's - a Polish Latin Rite Church and St.Gregory's - a Byzantine Catholic Church to which we belonged. Of course, with the possible exception or the Russian Orthodox church, the other 2 Slovak Lutheran churches and the 1 Slovak Calvinist church were not opened during the week days anyway. I loved that then in the 40' s I could even make evening visits to our church because it was safe to leave our church doors opened til late in the evening. I loved going into our darkened church where the only illumination came from the sanctuary light and the brightly burning votive candles. I think I really felt so comfortable and safe in this House of God and I believed then as I do now , that Jesus is truly present in the Blessed Sacrament in the tabernacle – a prisoner of love. Sadly, times have changed and we can no longer drop in at any of the Catholic churches outside of the prescribed times. The reasons are obvious. Nothing is safe or sacred any more. warning someone put their hand over my eyes. Wow, I thought what were they going to do to me? I then felt something soft and sweet on my cheek. I had just received my first innocent kiss from Herman! What a delightful surprise. That's the last thing I expected. Wherever you are Herman, you provided me with a loving remembrance of childhood innocence. Thanx so much. Those days are long gone- another casualty of modern times. Among my submissions to Our Echo I also included some other vivid memories of my childhood days called "Birdtown" - so I won't cover them here again. a great deal of the work unappealing. My employer and I realized that this was not the job for me. He helped get me a position with the City of Cleveland for which I was very grateful. I stayed with the city for 20 years and then happily retired in 1996. 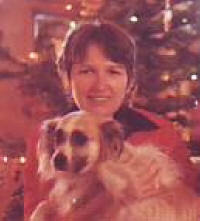 The year which I considered a "defining" one was 1975 when I got my first puppy- Peaches. She more than anyone or anything else changed my life and put me on a path I had never been on before and that was Animal Rights. She brought so much joy into my life that I began to delve into everything re the animals. I was much saddened by the cruelty I found practiced in research labs - much of it unnecessary and done in order to get lucrative grants. I was also unhappy finding out about how our animals were raised and slaughtered for food. In no time at all I became vegetarian and shortly thereafter vegan. One of the highlights of my concern for animals took me and other like-minded Greater Clevelanders to the Madison, Wisconsin Primate Center to protest what was being done to the unfortunate chimps who were being used there. In our minds -cruel and asinine experiments were being performed. In one they replaced a mother chimp with a surrogate - a fur covered block of wood which the baby chimp sadly clung to and hugged probably realizing full well - this was not "mom." He or she probably died from a broken heart and they called that "research." I wrote about this and other animal rights concerns in my book called "Blame it on Peaches." It also contains much of my life during this happiest of happy times when I and Peaches learned about each other and some of the other dogs and cats we took in as well as much of the animal world. I would like to say that my book was a success but sadly it was not. Probably too "homespun." I sold only about 6 books on Amazon. com. My sister Anna and I sold another five to ten more among friends and then I gave away approximately 200 books to anyone who showed an interest in reading it. Re-reading it myself, I see many weaknesses. However, I have no desire to rewrite it or another book. I was glad that Peaches and I had our day in the "sun." It was a very short and not a very sunny day, but I have no regrets. I did my best. It just wasn't good enough. I lost my beloved Peaches in 1989. It was a very sad day and one on which I don’t dwell because I prefer instead to thank God for the almost 14 wonderful and happy years I had her. They were far too short, but I believe that God will restore the earth one day and I will find her and all the other 5 dogs and possibly 30 cats I sent Him over the years. Thank you dear God for these many four-footed blessings. In the meantime, I will do all I can to promote the welfare of animals. I know that Our Creator loves all the handiwork of His hands -animal as well as human. Yes, I also care about human suffering, but thankfully, there are a great many more people who work in this venue. Would that we would not make divisions and work on both people and animal concerns and issues together. I think God would be pleased - don't you?